The Army terminated the X-Rod Program in FY96 for affordability reasons. The Army was competing the X-Rod against its STAFF system with a downselection initially scheduled for FY 1998. For cost reasons the STAFF program was terminated in FY 98 with final close-out in FY00. The Tank Extended Range Munition (TERM) program was continued through congressional plus-ups. The program developed one of the TERM candidates. The TERM was a 120mm tank ammunition development effort which would use a standard kinetic energy penetrator, a rocket motor and a dual mode semi-active laser/millimeter wave radar fire-and forget guidance. The TERM-KE provided greater hit probability at extended ranges, both line of sight and beyond line of sight, increasing kill probability and expanding the Maneuver Task Force Commander's battle space. The TERM-KE was one of two concepts being evaluated in the generic TERM Science and Technology Objective (STO). The program was in the Concept Exploration phase. A unique system contracting strategy to prove out innovative component technologies was instituted at inception of the program. A modified Integrated Product Team is being used to leverage the expertise of both the Army and the contractor, Alliant Techsystems. The Extended Range Munition [ERM] was a concept (endorsed by USAARMC) for extending the battle space beyond the current 3 to 4 KM max. line of sight range, by allowing engagements beyond line of sight to more than 8 KM. It exploits the ability of the Scout vehicle to acquire and designate targets; the Digitized Communication technologies to pass targeting information, in real time, to the maneuver commander or shooter, and smart munitions technologies to provide a munition capable of being fired from a 120MM tank gun at extended range non line of sight targets. The XM1007 Tank Extended Range Munition (TERM), also known as the Tank Extended Range Munition-Kinetic Energy (TERM-KE), was a new 120 millimeter munition for the M1A2 Main Battle Tank, that would extend the maneuver commander's battlespace beyond line of sight (BLOS) to more than 8 kilometers. TERM exploits the capabilities of the Future Scout and Cavalary System vehicle to identify and illuminate BLOS targets to pass digitized targeting information, in real time, to the tanker. Using brilliant technologies TERM will enable the tanker to destroy high value moving targets at more than twice the current battlespace. TACOM-ARDEC was exploring multiple concepts to meet user performance requirements. The ERM concept will provide the Armor Maneuver Force a major advance in combat capability. By being able to engage non-line of sight targets at extended range the Maneuver Commander can engage the enemy before the they can return fire. This program will take advantage of force XXI digital architecture to provide the Maneuver Commander with responsive organic fire which is not a fire support asset. It does this by integrating new technologies in sensors, communication and smart munitions into new Tactics, Techniques and Procedures. Several missile and projectile based concepts have been proposed for this mission. They employ advanced Radio Frequency millimeter wave and or Infra-Red sensors linked through a guidance and control system to aerodynamic control surfaces and or thrusters to control the flight path of the munition. 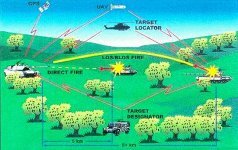 The system concept could use several different acquisition systems (Scout, UAV, Tanks) and guidance strategies to fire the long range engagements. The Scout could locate the target and pass the digital targeting data to the tank where the on-board computer and fire control system calculates the firing solution and whether there are any terrain features in the way. The gun would be automatically slewed to the correct position and any in flight trajectory maneuvers would be fed to the round through the data link during the fire pulse. After launch and any mid course maneuvers the munition would activate its seeker and scan for the target. Designation by the Scout would improve the return signal from the tank and keep the munition from going after false or dead targets. In late 2001, as part of the FY '03-'07 Five Year Defense Program's Program Objective Memorandum [POM], the Army cancelled a total of 19 programs, including the Raytheon Tube-launched Optically-tracked Wireless Fire and Forget missile, the BAE Systems Advanced Tactical Infrared Countermeasures (ATIRCM), the General Dynamics Hydra rocket, the United Defense, L.P. M113 armored personnel carrier recapitalization, and the Tank Extended-Range Munition (TERM).